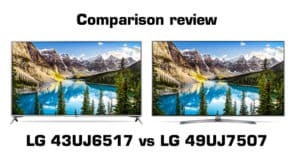 Following the comparison review between LG’s 2017 UHD LCD TVs, I had a chance to directly compare two OLED TVs that many consider best buy choices for around 2000 euros. 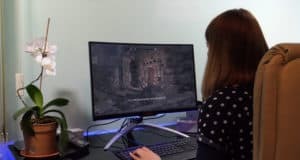 Both are based on LG Display’s WRGB OLED panel technology that was widespread at this year’s IFA show in Berlin not only from LG and Philips but from many other brands as well. 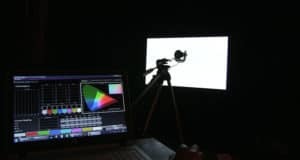 I had more than generous period of one month to conduct numerous calibrations and picture processor tests to get to know strengths and weaknesses of both sets. Which is a better choice for the money – read on to find out. Best buy TVs - highly recommended! Summary : Both LG OLED55B7V and Philips 55POS9002 are excellent TVs and true best buy choices considering the price. A high-quality design on the outside is combined with stable and content-rich Smart TV platforms and excellent picture quality that can easily rival more expensive OLED TVs on the market such as those from Panasonic or Sony. I was highly impressed with factory picture accuracy on both TVs - even HDR did not scream for calibration out of the box. With that being said, LG did end up with slightly better picture quality, support for Dolby Vision, lower input lag and more user-friendly Smart TV platform and remote, so I consider it as a winner of this duel. Still, they both are excellent choices and get my full recommendation, especially considering the price for which there are almost no alternatives. WRGB OLED technology nowadays allows TVs to be mounted on the wall like a poster or a wallpaper. Of course, in that case, the panel is separated from the electronics, speakers, and connectors which are placed in an external unit. Though they are based on the same OLED technology, both TVs are designed in a more classical manner where everything is joined together – the panel on the front and electronics, connectors and speakers at the back. In case of Philips, add to the list an array of LEDs that will bring colors to the wall behind the TV (3-sided Ambilight). What is slimmer? Blade or razor? Blade apparently if we judge it by the thickness of the bezel as LG’s “Blade slim” B7 has 2-millimeter thick silver bezel while Philips “Razor slim” is one millimeter thicker. Both bezels are nicely rounded without sharp edges in the corners. 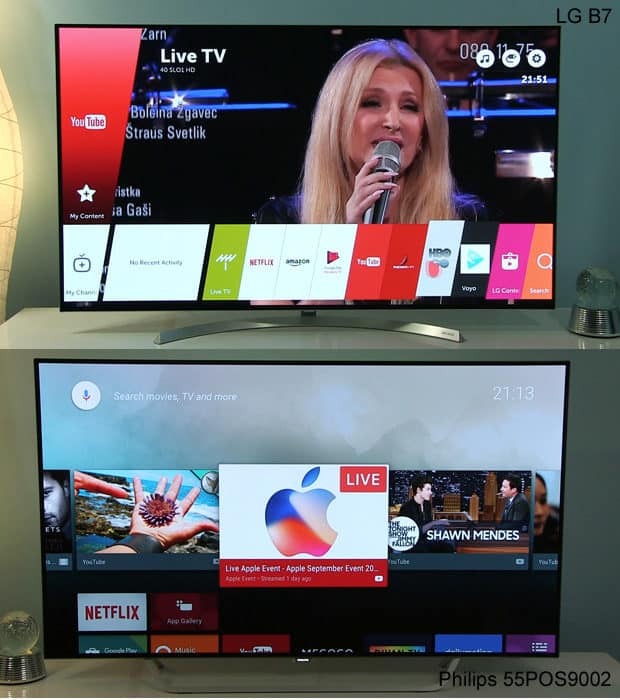 So in terms of the bezel, both TVs are very similar, but there is one point that slightly separates them. For the first time this year, LG decided to remove its brand name from the well-known position at the center of the bottom bezel. Instead, it placed in on the crescent stand which now has “LG OLED” printed in dark letters instead of just “OLED” like it was done previously. Philips has stayed true to its current design trends present on their TVs and monitors by placing the logo on the extension below the center of the screen. As it goes with high-end TVs such as this one, the logo is backlit and can be adjusted to be turned on or off while the TV is powered on. A look from the side reveals that LG did not change much compared to last year – thickness is just below 5 mm in the top half and 48.6 mm in the lower half. Philips designed its TV a bit differently – only top 18 cm and less than 4 cm on the sides is below 5 mm and the rest is just a bit thicker than on LG’s B7 – measuring at 49.6 mm. 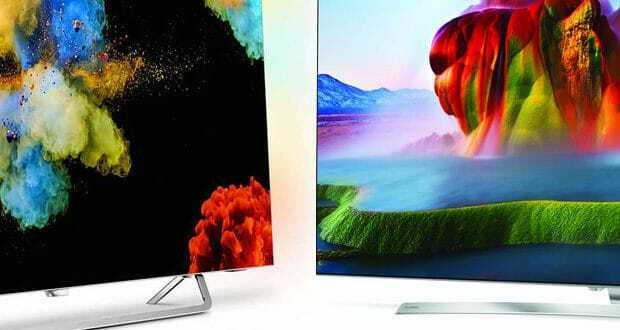 In reality, both TVs are very slim and will look great on their stands or hung on the wall. Stands are uniquely designed on both TVs. LG has yet another variant of its “crescent” shape with clean silver matte texture. 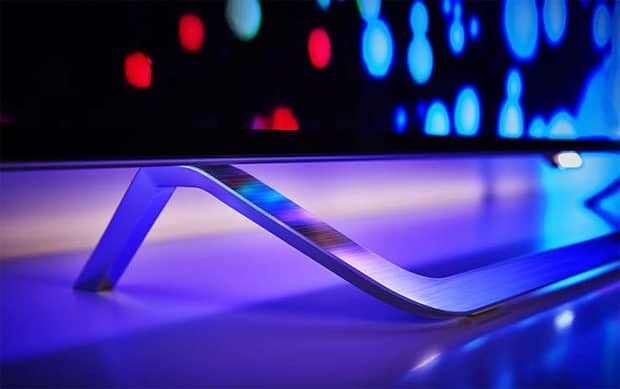 Philips’s stand looks as if the screen is held by the crest of a wave – it manages successfully to emphasize lightness that only TVs based on OLED technology have. It is also nice to see that both stands are centralized, meaning that it is not necessary to have a table as wide as the TV itself. 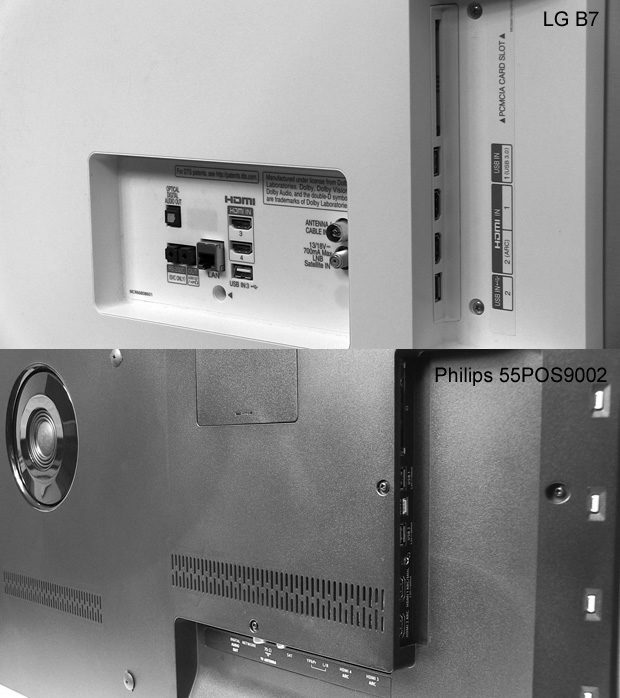 As already mentioned, both TVs can be hung on the wall using standard VESA mounts – 200 x 300 mm for LG and 400 x 400 mm for Philips. Coming to connectors, both have separated into two sections – on LG one set is looking to the side and one to the back while on Philips one is looking at the side and one to the bottom. I prefer Philips arrangement as this puts less strain on the cables and enables closer to the wall mounting. Both TVs have 4 HDMI ports but it is worth noting that LG has all of them in version 2.0b (UHD + HDR support) while Philips has only two. LG has one extra USB port but lacks component video and audio inputs that are available on Philips with supplied adapters. Wi-Fi and Bluetooth are available on both. All the items above show just how similar both TVs are in terms of design and handling, so this section ends with a draw. You will get multi-functional remote controls with both TVs. So-called Magic remote with LG and remote with full QWERTY keyboard with Philips. My personal favorite has been for a long time Magic remote due to its versatility, great ergonomics, and excellent pointer precision. With this year’s Quick Access functionality, Netflix and Amazon video dedicated buttons and overall great layout, I had more comfortable experience with this remote than with Philips’. 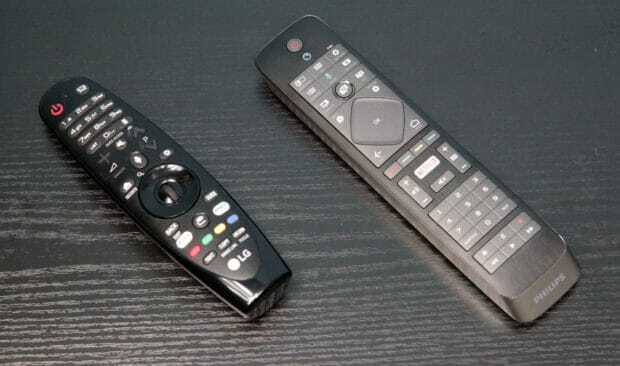 Philips has buttons that are too close to each other and they are very similar, making it often difficult to find the right one, especially if you are not looking at the remote. Just like previously tested UJ75 and UJ65 series, so does OLED55B7 come with webOS in version 3.5. The same findings I reported in that comparison review are valid here as well – the look and feel of the platform did not change compared to 2016 webOS 3.0, it still is very easy to use and to customize it. Except for quicker boot time, I did not see much of a difference in overall speed of the latest installment as the delay is still present in the settings menu. Still, the platform is very stable and all apps that I’ve installed and tried worked great. Magic remote and LG TV Plus app were two more reasons why I did like using webOS 3.5 on B7 OLED TV. Compared to Philips TV remote app which was not working perfectly stable and would shut down when I was trying to send a photo or a video to the 55POS9002, LG TV Plus app was responsive and would display the content from on my iPhone SE. At the time of writing this review, only Android 6.0.1 (Marshmallow) was available on Philips TVs, with version 7.0 starting to roll out. The home menu on 55POS9002 is the same as I’ve seen before – fixed layout with Recommendations in the first row, Philips Collection apps, Apps from Google Play Store, Games and finally Settings. Within the Settings section is quick access to all settings sub-menu, channel install, how to… guides, Wireless and networks, app manager, help and update software sub-menu. The platform was responsive and very stable – during the 1-month long testing period, I did not see one single message about an app crashing which is a good thing. Still, I do not like the fixed layout of the main menu and lack of any customization. Philips will update 2016 and 2017 Android TVs with Android 7.0 (Nougat), so it will be interesting to see how will this affect user experience. Now that stability issues seem to be out of the way, hope to see Android TV platform that can compare shoulder to shoulder with webOS and Tizen OS in terms of simplicity. Both TVs have a built-in media player that can be used to play media from USB or local network. Just as on TV models before, LG has a better media player that plays a wide range of video content perfectly smooth, even in case of UHD HDR content over a local network. Philips, on the other hand, struggles with such content, but this can be partially solved by installing players such as Kodi or VLC. What I’ve noticed is that Philips struggles to play content smoothly even through Kodi, with stutterings and frequent pauses. On both TVs, subtitles can be displayed if they are inside the MKV container or as a separate file (which needs to have the same name as the video file). Great review- be great to see a comparison to the new Toshiba when that arrives. Hi David – thanks, glad you like the review. Yeah, I would like to test Toshiba OLED – hopefully it will reach Croatia at some point. Really at a loss between these two. Philips with the ambilight and better processing software. LG with the better overal OS, remote and support. I am following your website and reviews from Malta (in the Mediterranean sea). Thanks for the excellent work which you are doing! My Philips TV from 2009 had a big problem with the panel and I have to replace it; not worth mending. I am really torn between LG B7 and Philips POS 9002. Both local suppliers here in Malta provided very competitive prices with a marginal difference between the two so price difference is not an issue. I use TV a lot especially satellite TV on Dreambox where most channels are either HD or SD (i.e. 720 * 576 or 1280 * 720 or 1920 * 1080). I love the Ambilight and think that Philips has better processor (P5 – upscaling) but it is a pity that it does not have Dolby Digital nor Dolby Atmos. On LG I love the operating system and its vibrant colours. And the additional systems available: Dolby, Technicolor. So my puzzle is this: are the additional systems so important or given that I use most satellite TV (and internet-streamed content too), upscaling of lower-quality content more important? Is the upscaling on the LG say of SD or HD content inferior to that of Philips? If you were in my position, Darko, which way would you go – for the LG or the Philips? 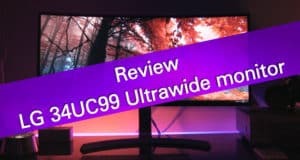 I have finally decided on purchasing the LG B7 over the Philips but have heard about, and also followed various Youtube videos relating to burn-in / image retention which apparently is not covered by warranty. Because of this I have become scared of Oleds and am seriously considering the Samsung QLED Q7. A word of friendly advice from Darko would be greatly appreciated. Hi. I’m in the same place as you are, between LCD (Sony XE93 or even XE90) vs OLED (LG C7). While OLED are miles better PQ still there are people reporting issues with screen uniformity. On other hand LG has all the bells and wishes regarding technology, great OS. Sony has, maybe better upscaling and doesn’t need to be bed-in (no worries with static content), good with sport content (moving resolution). I would like to have possibility to spend some time with booth TVs and then decide for one, but I think it’s hard to arrange. I’m still to contact local stores on their return polices, eg if there is return-it-no-questions-asked policy then I would go that road. I’m also owner of 2006 LCD Philips set and one thing is for sure it’s going to be a huge improvement with either set. rtings.com tests image retention results: B7 1.2/10; C7 5.4/10; E7 5.2/10. The B7 result is very strange as it is completely out of range relative to the other LG sets (which ultimately share the same panel) namely C7 and E7. In 2016, all B6, C6, and E6 LG sets got very similar results: B6 1.3/10; C6 1.3/10; E6 1.2/10. I think that there is something strange with the B7 result as rtings.com itself seems to be implying (please confer with above quote). There could have well been something bad with the particular B7 set tested, although I cannot say this for certain. On image retention this got 3.7/10 (which is better than LG B7, although not as much as LG C7 and E7). On the internet, I could not find many instances of image retention / screenburn on A1E and this bodes well. In conclusion, I shall be going for the OLED but shall avoid the B7 (just to be safe). Either LG C7 with a soundbar or E7 or Sony A1E (the latter two not needing a soundbar). If only Darko could give us a friendly word of advice! Any further feedback on this from anyone would be welcome. Imam namjeru kupiti LG OLED55B7V 55″ uskoro. Sve sam proučio ali nikako da pronađem informaciju o dugotrajnosti OLED panela novije generacije. Ipak je to popriličan novac za nešto što nije neophodno, a da recimo traje samo 5 godina i nakon toga da počne gubiti na kvaliteti. Mislim konkretno na boje i svjetlinu panela. Moram li brinuti o tome ili je to sa novijom generacijom OLED-a rješeno? Bilo kakav feedbac je dobrodošao. BTW, super ti je YT kanal i recenzije na webu. Pozdrav, jesi nasao info vezano za trajnost panela?